After months of construction it is not long now until ABBA The Museum finally opens. The modern ‘blonde wood’ building on Djurgården, Stockholm that will house the world’s first permanent ABBA exhibition is nearing completion. As opening day looms, convoys of trucks roll up to the site to deliver the furnishings, costumes and many rare items of authentic memorabilia that will make up the exhibition. So what can fans expect to find at the museum? The museum will naturally pay homage to ABBA’s music, and in this respect the team behind the museum have installed the best sound isolation system in the world and commissioned specially designed sound absorbent wallpaper, to enable them to simultaneously play different tracks in each room. Last December, ABBA The Museum and Spotify (the digital music service), announced a unique collaboration to integrate and extend the museum experience both through Spotify’s various platforms and within the actual museum. Hansson doesn’t expect visitors to flock to the museum to hear the group’s hits, however. Rather, they will get to relive the band’s journey all the way from their pre-ABBA solo careers in the 1960s, through to their split in 1983 and get a sense of their lives behind the scenes. As visitors tour the exhibition, the four ABBA members will each recant their stories via the museum’s audio guide, which has been written in collaboration with the band by Catharine Johnson, who wrote the musical Mamma Mia!. In a room dedicated to the song Ring Ring, a chunky red 1970s telephone will be on display. This phone is connected to an outside line to which only four people know the number – Agnetha Fältskog, Björn Ulvaeus, Benny Andersson and Anni-Frid Lyngstad. Next to the phone there is a sign telling people that if it rings they should answer it because it will be a member of ABBA calling. “It will be a real phone call and they have all promised to call regularly,” Mattias Hansson confirmed. “It was Frida’s idea, so of course she’ll call!” says museum curator Ingmarie Halling. As ABBA’s stylist from 1976 to 1980, an era she describes as “fun and magnificent”, Halling was the person behind many of their glitzy and flamboyant costumes, and she has been instrumental in collaborating with them to ensure that some of those outfits are included in the exhibition. As well as the costumes, Halling has managed to secure Björn’s star-shaped ‘Waterloo’ guitar, Benny’s very first accordion, gold discs, and much more besides. “They’ve lent us lots of stuff,” Halling confirms, and whenever I call them to tell them my ideas they say, “sure, go ahead!”. Many of the exhibits in the museum, including the Hep Stars tour camper van and the iconic helicopter featured on the Arrival album cover have been installed to provide fans with wonderful photo opportunities. Visitors will also be able to experience a little of how the ABBA members lived their lives through the museum’s painstaking recreations of Benny and Björn’s song-writing hut on the island of Viggsö, manager Stig Anderson’s office, their on-tour dressing room and the Polar recording studio. In the studio is the original mixing console, instruments and other equipment. 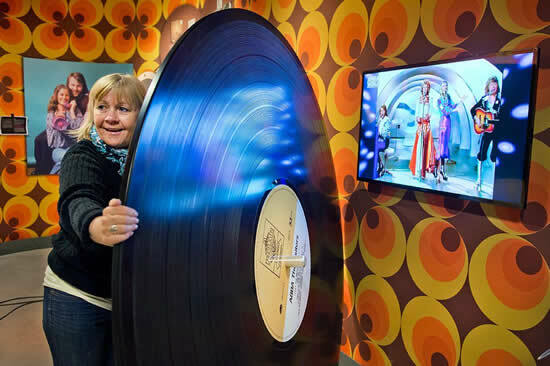 Within this exhibit, visitors can try their hand at remixing classic ABBA tracks and also record their own versions of the hits in the row of ‘singing booths’. You can try on iconic ABBA costumes virtually thanks to a motion-sensing device that adds them digitally to your image on a screen, while fans that have dreamt of becoming the fifth member of the band will be able to sing and dance on stage with computer simulated life-size holograms. Back in the days before social media, visitors might have been happy just to try these activities. However, today many people want to share their efforts with friends and this is where ABBA The Museum is different. For each interactive exhibit the museum allows you to share the results through your social media accounts, or simply keep them for later. With so many interactive exhibits based on technology there is always a danger that the museum could look dated after a few years. But ABBA The Museum says they have built a strategy to review all the exhibits at least every two years. “Some things will need to be replaced but history tells us that we will be able to use some things for 20 years.” Linked with this strategy is the decision to focus today on the Stockholm museum. “Though there are so many opportunities for virtual visits we are not going to do that for now. And the only travelling exhibitions will be to promote the museum. You really have to be here,” says Hansson. Although advance tickets for the first few weeks, which are time-slotted in a bid to cut queues, are almost sold out, for those who prefer to make a spur-of-the-moment visit during May there will be a limited number of tickets on sale at the venue. Please note that you will need to take your credit card as it will not be possible to buy your ABBA The Museum admission ticket or purchase any of the merchandise available in the museum shop with cash. Talking with SvD ahead of the museum opening, Björn was asked about the journey to a museum, which of course started with winning Eurovision all those years ago. “I never thought we would win. We chose Waterloo and Hasta Mañana as possible entries. But Waterloo was more fun to perform,” says Björn Ulvaeus when I meet him in a restaurant on Djurgården. He has recently turned 68. He usually gets compliments that he looks younger. He is definitely slimmer than during the ABBA years, which is because he trains. When he goes through the menu to see what he’ll order he dismisses dishes with too many carbohydrates. We’re talking about the transparent mini helicopter from the cover of the Arrival album. And Polar Studios, of course. And then the bench where Benny and Anni-Frid are kissing while Björn and Agnetha sitting next to them are stony-faced. “It’s a fun picture, iconic. 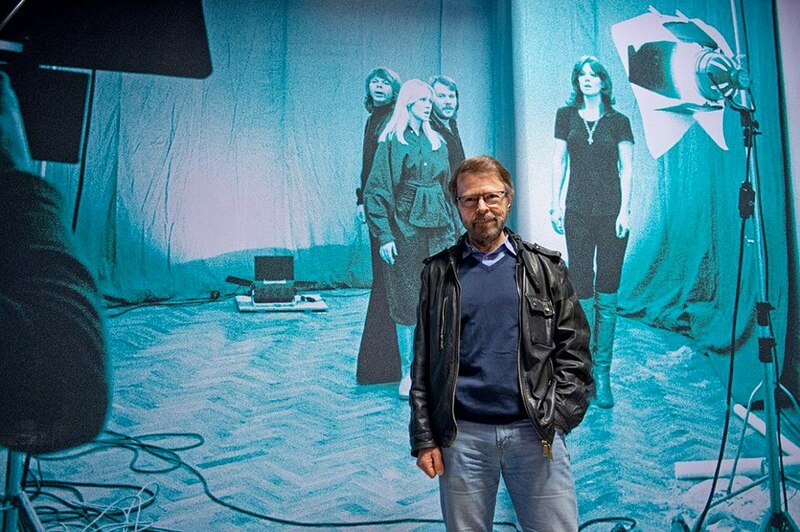 The whole story of ABBA is a real Cinderella story,” says Björn Ulvaeus. Ingmarie Halling has worked as a stylist with ABBA intermittently for 36 years and still meets all four privately. Thus, she is also well suited to describe the members. “Agnetha is incredibly grounded, a small-town girl who enjoys a simple life. It hurts me that people talk about her as a Garbo for she really is not. Rather, she is a little naïve and does not think that people recognize her. “Frida is the nomad, a globetrotter who puts down roots and then it is her home. She is worldly-wise and street smart. “Björn is curious and open to new ideas and arguments. A strange combination of businessman and poet. A contractor by God’s grace. Originally an ABBA museum would be situated in the old Customs House on Stadsgården. In 2008 the ticket sales began but the site was in poorer condition and the costs were higher to renovate than anticipated. The contract with the property owner Stockholm Hamnar fell through. Instead of an ABBA museum in 2009, a photographic museum opened in the building in 2010. For a couple of years ABBAWORLD toured with many of the gadgets that will be available in ABBA The Museum. Benny Andersson has said about the new museum that “I have nothing against it at all, but think that maybe they could have waited for 30 years.” He will not say much more than “the museum will stand on its own feet.” Björn Ulvaeus however says that he feels that there is now a lot of space between when ABBA split up in 1982 and now and so sees himself as a flag waver for ABBA The Museum. “Yes, when one has gone into this, then it is to do it from start to finish. It is not enough to create content, but also getting word out that it exists. Therefore I have or will visit England, Russia, Germany, Finland, Norway and Poland to do promotion. But earlier ABBA did not want to hear about a museum? And the other three in ABBA are more passive supporters but not you? I also want to be proud of an ABBA museum. As it has been so long since ABBA, I can do this as if it were someone else, investigate why ABBA’s reach was so terribly wide,” says Björn Ulvaeus and smiles. Just where he puts his finger on the crucial issue. How could a Swedish group defeat an entire world, something not done before and that almost everyone saw that completely unrealistic? “An ingredient is the amazing story of us, that we so organically became a group. In a natural way. Benny and I met and started working together. Quite apart from this fact, we got together with two women who happen to be great singers, a blonde and a redhead who are also beautiful. We hang out, sing for the fun of it and have no intention to start a group. Eventually it becomes apparent that we should do something together. It happens to be so genuine and organic that it is hard to put your finger on. When S.O.S was released in Australia, ABBA made a video that they sent to the other side of the earth. “Absolutely. Greatly proud, amazed and humbled. Otherwise, I would not get involved with this museum. It is not entirely possible to emotionally embrace the journey that ABBA made , that we have sold 380 million records and touched the hearts of people…or that 50 million people have seen Mamma Mia! After the opening ceremony on May 7, Björn Ulvaeus will scale down his involvement, even if he is still the largest shareholder, and attends the board meetings. Just how the museum will do, is another major issue. If it is a success or not. Björn Ulvaeus think it may be problematic for example, during the cold season. In the 1970s in Sweden, it was not socially acceptable to like ABBA. Culture pages printed articles where the progressive left side complained about commercial brainwashing and how detestable ABBAs ‘simple’ pop music was. The contempt – or even hatred – sometimes bordered on the kind of hate that Palme attracted. Ingmarie Halling recently chatted with Anni-Frid Lyngstad about that time. Björn Ulvaeus does not think that the ‘Prog Rock’ movement (Proggen) was something that at the time he got upset about. “We were not affected by it because we were so totally focused on what we were doing. Proggen was never ever something important, it was a marginal phenomenon. There was not a single innovative thing that came from it aside from a few songs by Nationalteatern and Hoola Bandoola that was a good band. But of course we knew that some of them were horrified and said that the fact “they sell so many records, it is somewhat suspect.” But do not forget that there was another Sweden – we had advance orders of 760,000 copies of The Album. The criticism was so peripheral. But of course you did just create products to make money? Nationalencyklopedin, the National Encyclopedia writes, among other things, that ABBA “is characterized by the carefully crafted style blends of 1970´s pop and dance music.” But not a word about the lyrics. “Benny was the musical engine but we always wrote together. I wrote thye lyrics when there was a basic track with stuff on top, so you had a sense of what the song actually was. Lyrics have always been unfairly treated, but the songs that pervade often have high quality lyrics as well. Björn Ulvaeus does not always remember how the lyrics came about. In recent years, he complained that many of his memories of the ABBA period have been forgotten. But it has noticeably improved in working on the ABBA Museum project, and he has been able to dig back into the past. I remember Frida and Benny first did it in Swedish and I thought it was such a fussy lyric when it referred to a “Latin lover”. But one night I was lying on the dock in Viggsö and looked up at the stars. And there was something in the air. Fernando had suddenly turned into an old freedom fighter!”. A+ Reviews for Agnetha in The Times. Comments : Comments Off on A+ Reviews for Agnetha in The Times.